In today's high-speed Internet world, to grow your business, it is increasingly crucial that your organization can move, add and manage subscribers quickly and efficiently. A fast, affordable, secure, reliable network is paramount to success. Deploy the wireless wide-area with smartBridges and break free of the confines of your current solution. Within any given metropolitan, suburban or rural area, broadband wireless access is by far the easiest and most cost-effective way to realize your high performance network. Whether you're creating a network from scratch, or need to augment or replace your existing wire line links, broadband wireless access is the most reliable and cost-effective, high-speed data networking alternative you should know more about. Put simply, wireless is the lowest cost and most easily implemented solution today for the last mile. And what better way than deploying the smartBridges new suite of advanced airPointPRO and airBridge solution - the last mile alternative that gives you the most bandwidth for your investment ---- and the freedom your ISP business deserves. Broadband wireless connectivity gives you wire line performance without wire line costs and wire line restrictions. Operating in the 2.4 GHz license-free spectrum means no recurring license fees. And because you own your infrastructure, there are no monthly line costs. The best advantage comes in not being dependent upon the telephone company. Broadband wireless means freedom for your ISP business. Broadband wireless links can be deployed faster than wire line links. As well, your broadband wireless network can be quickly, easily, and inexpensively modified to meet your changing connectivity needs. A broadband wireless network gives you flexibility to painlessly add or eliminate locations, or secure additional bandwidth. A wireless link provides throughput rates several times faster than those offered by wire line alternatives. And unlike wire line high-speed circuits that are typically available only in urban centres, broadband wireless links can be deployed virtually anywhere, urban, suburban, and rural locations. Wireless networks are reliable, providing high availability and consistent throughput over a distance. Also, there is considerably inherent security in wireless networks. Barriers to physical tapping and WEP encryption together provide a layer of security to wireless links. Connecting LANs together using wireless links is significantly less expensive than upgrading existing wires or laying new ones. As well, wireless infrastructure is less prone to required maintenance than wire line infrastructure. Easy to Deploy, Install and Manage!! smartBridges helps WISPs around the world deploy wireless networks, quickly and efficiently. Our solutions provide the WISPs tremendous cost savings, strong customer retention and loyalty, and easy management. The airBridge series from smartBridges provides the WISP with an entire suite of customer premise equipment (CPE) to choose from. This gives added flexibility to the WISP for deployment. The airBridge TOTAL provides high-speed Broadband access to all the subscribers who are located within a 10 Km radius of the WISP. Subscribers who live further away can be connected using the airBridge Outdoor, with the best-fit antenna. SmartBridges CPE are certified to work with a number of FCC/ ETSI certified antennae. The WISP can pick and choose from a large selection, the right antenna for any customer location. The airBridge with an external antenna will also be a easy to implement CPE, when supporting single users. Why is the airBridge Total an ideal choice for a WISP? 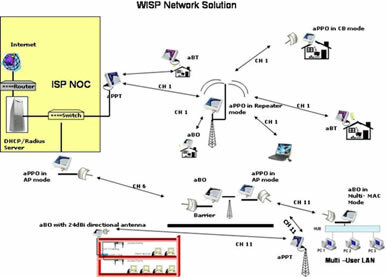 This is a typical WISP network which illustrates the unmatched flexibility of the airBridge and the airPointPRO series. The ISP NOC has a central RADIUS server, which sits behind the switch. Using simpleNMS, the ISP can remotely monitor and manage the entire network from the NOC, since smartBridges devices support remote management. This enhances the efficiency of the ISP . The ISP can also configure Access Points and airBridge devices to take lease from DHCP server. Driverless Plug N play installation makes the airBridge series the optimum choice for CPE deployment .With its strong experience in wireless networks, smartBridges ensures a design to support a quick configuration and deployment of the airBridge and the airPointPRO Series. simpleDeploy further lowers the deployment cost of the WISP by enabling mass configuration of the wireless LAN equipment to the WISP’s default settings. This saves cost and time fore the WISP by lower time on site for deployment and resetting a CPE. • Less time to implement – Saves Money and wins customers! Each and every device belonging to the airBridge and airPointPRO family on the WISP’s network can be remotely monitored using the simple Monitor. WISP’s NOC can manage/monitor all the Access points & airBridge devices using simpleMonitor software. simpleNMS further scales up the manageability of the WISPs network by enabling the mass upgrade and remote management of the remote smartBridges devices. It provides the WISP an eye into the network, showing its internal functioning.